Staff from Huddersfield firms Reliance Precision and Mamas & Papas swapped tools for guns and their comfy work space for wild moorland at the end of last week, in a special exercise run by the military. Seven staff from the firms, ranging from junior to senior managers, took part with other organisations from across the region, in a demanding two-day challenge held at Driffield Training Centre, which involved working in teams on a variety of challenges such as launching a search and rescue mission for an RAF downed pilot, evacuating casualties from a Land Rover ‘WMIK’ hit by an explosive device and erecting a Navy signal. 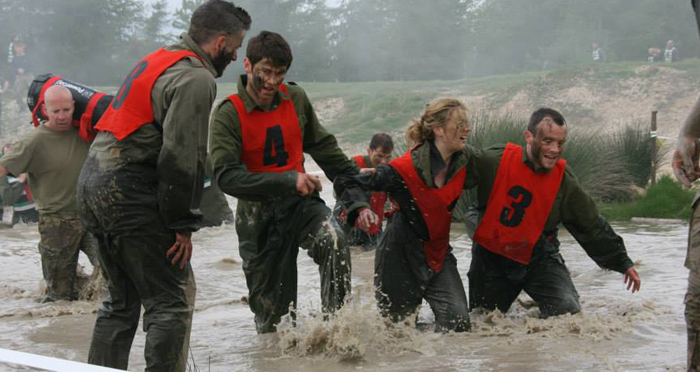 The exercise, called ‘Executive Stretch’ was run by employees who also serve as Reservists in the Navy, Marines, Army or RAF in units across Yorkshire and the Humber. The two-day course, organised by 150 Transport Regiment, was designed to provide a unique opportunity for business people to enhance their personal leadership, teamwork and communication skills, as well as gain a valuable insight into the transferable skills that Reservists develop during similar training exercises.